Hawaiian Airlines has long had a size issue. Ever since the DC-8s were retired back in the 1990s, the airline has only had large widebody aircraft to fly to the mainland. This wasn’t necessarily a problem for the airline, but it limited the type of routes it could fly. While other airlines like Alaska ramped up on tons of thinner routes with narrowbodies, Hawaiian had to sit and watch. Now, Hawaiian has put its first A321neo aircraft into service, and that smaller airplane means Hawaiian has a whole new range of opportunities. Hawaiian decided to first use the new airplane to bolster existing routes, but yesterday, the first totally new airport was announced. It just happens to be in my backyard: Long Beach will get daily Honolulu flights starting June 1. This is a very interesting choice, and it’s one that required JetBlue to independently decide to give up a slot. I’d say both airlines are likely happy about that. Flights from smaller West Coast cities to big Hawaiian cities like Honolulu. Flights from big West Coast cities to smaller Hawaiian cities like Lihu’e or Kona. Add frequency on big trunk routes like, potentially, LA to Honolulu. So far, Hawaiian has focused on the second bullet point. It put the A321neos on routes it already operated like Oakland to Kahului (which started yesterday), Lihu’e, and Kona. But the question remained, when would Hawaiian open up new cities with the airplane as promised? That starts June 1. Technically, the airplane comes in on the evening of May 31 so it can operate the inaugural westbound flight on the morning of June 1. It’ll be a typical West Coast-Hawai’i pattern where there’s a morning flight to the islands with a return that evening. The flight will arrive at 9pm, an hour before the Long Beach curfew kicks in. Is this going to work? During the summer, I bet it’ll do nicely. During the rest of the year, I’m not so sure. But wait, isn’t Long Beach slot-restricted and full? Yes, but here’s where this story gets interesting. Long Beach has 50 slot pairs for daily flights on big aircraft, and they’re all currently taken. So how on Earth did Hawaiian get one? Well, it turns out that Long Beach has a waitlist for slots. Up until November, the waitlist was comprised of existing airlines. Delta was first, JetBlue was second, and Southwest was third. But then Hawaiian showed interest in flying to Long Beach. When Hawaiian joined the waitlist, it zoomed to the top, as any new entrant would per the noise ordinance rules. Every other carrier would have been notified that the waitlist was going to be updated. They would have been asked if they wanted to remain on the list, and then when the new list was generated, they would all know who was on it and in which position. Seeing Hawaiian at the top, JetBlue must have had an idea. JetBlue has long struggled to figure out how to serve Long Beach. No matter what it tries, it just can’t generate a decent fare. Things got worse when Southwest entered, but JetBlue didn’t want to walk away from what really is its only West Coast operation of any substance. It went into defensive mode and started flying slots as required to keep Southwest from getting more. JetBlue admitted that things weren’t working well. It told employees to keep watching as it looked to find better ways to use the slots including possible flights to leisure destinations like Santa Rosa or Steamboat Springs. That’s probably still on the docket, but there was another opportunity that presented itself. When the waitlist was updated, JetBlue undoubtedly saw that Hawaiian was now at the top of the list. It’s obvious to anyone watching that if Hawaiian got a slot, it would use it to fly to Honolulu. That’s music to JetBlue’s ears. If Southwest gets a slot, there’s a good chance it gets used to compete directly with JetBlue. But if Hawaiian gets it? That’s fine. In fact, it’s good. JetBlue and Hawaiian are frequent flier partners, so members of each program could earn and burn miles on each other. There could even be codeshare opportunities between the two (though not many considering the schedule Hawaiian ended up putting out). So it was that in December, JetBlue made the strategic decision to give up a slot while oddly remaining on the waitlist for additional slots. It must have had to cross its proverbial fingers and hope that Hawaiian was serious about flying to Long Beach. Will It Work for Hawaiian? Long Beach is a tough market, and it generally underperforms on revenue compared to other LA Basin markets. But Hawai’i could be different. First, there is also absolutely no service from Orange County to Hawai’i any longer, so this will have much broader geographic appeal compared to something like Oakland or Vegas which has service from every airport in Southern California. Second, you have a much higher percentage of leisure travelers who fly less frequently. They won’t be loyal to specific airlines as much, and they’ll be more willing to look at various airport options. Lastly, you have the Hawaiian diaspora around Southern California in cities like Gardena, Carson, and even Long Beach itself. Long Beach is the most convenient airport for people in those areas. In the summer, I’d imagine this will work well. It’s the rest of the year that has me less sure. But all those reasons listed above make me think there is a chance of this working. I like Hawaiian giving it a shot, and it bodes well for the airline getting creative as it gets more of these airplanes. I imagine some other West Coast cities are eagerly drooling at the prospect. Jetblue only uses about 25 of their slots anyways. They’ll play this game a few more times if HA wants to launch flights to other islands. Given the recent reduction by AA, I’d put money on the fact that WN or B6 could launch LGB PHX and collect the remaining AA slots after a short period of time too. Mark – JetBlue uses all its slots. It previously underutilized its slots until Southwest arrived. At that point, Southwest was able to temporarily use any slots that weren’t being fully utilized, so JetBlue ramped up to near 100% utilization to keep Southwest out. They use all of their slots to the bare minimum expectation and since slots aren’t paired with specific takeoff/landing times, they have several slots that essentially don’t get used. I think they have to use each slot 30 days every 60 days, but 1 flight operating 60/60 days can use 2 slots if you re-time it slightly half the days. I’m not an airline expert so this might seem like a dumb question to more informed readers. In pictures of Hawaiian’s new plane, I noticed it had a German tail number: D-AVAF. Is that because they were publicity pictures? When would the plane receive an N registry? That’s a testing registration while the airplane is still owned by Airbus. It goes onto the N registry once Hawaiian takes possession of the airplane. Also: that HA schedule at LGB has, as first glance, zero connectivity to the B6 network. I get why it’s not a huge priority: there aren’t any natural traffic flows (of significant value) that come to mind. Kevin – Technically there are some connecting options on the outbound with flights arriving from the Bay Area, but that’s pretty useless since those markets have nonstops to Honolulu on Hawaiian anyway. The only one that’s mildly interesting that I found was that Austin has a connection on the way out. It doesn’t connect on the return though. Cranky, I am not that familiar with LGB. What would happen if the flight from Hawaii lands after curfew? Also with the plane being an Airbus 321 will there be weight restrictions in warm weather? Wild Bill – If they land after curfew, they get fined. It’s not a hard stop where they’d have to divert. As for weight restrictions, I can’t imagine that being the case at any time. This is a neo, so it has much better operating performance. Flying out of LGB in the early morning means it’ll never be that hot. And the return from Honolulu shouldn’t be an issue either. CF LGB DOES NOT have a curfew! The noise limits change to a level that is virtually impossible for even a Cessna 152 to meet, but there is NO CURFEW at LGB! For those like myself who were wondering, the A321neo already has 180 minute ETOPS certification from the FAA, so it sounds like all pieces are in place from that angle. Kilroy – Yep, Hawaiian launched Oakland-Maui yesterday, so this airplane is already flying similar routes. There is no ETOPS issue. Well this is certainly bad news…. …for my 2018 prediction that Jet Blue is going to throw in the towel at Long Beach. This move buys the airline more time on having to pull or not pull that trigger. Dang. And that was my most daring prediction too. where can they go to be relevant on the west coast? They never got LGB to grow profitably (never got e190 to commuter slots or FIS), let VX grow LAX/SFO (and the legacies) to the point where they will never get enough share or enough profit to be worthwhile, OAK didn’t work out despite an old MX base at one point. Do they try a LAS or DEN? PDX? Or do they just become an East coast airline with token west coast presence? As a resident of the Midwest, as far as I am concerned B6 is a COAST airline, period. Their route map has more ink on the East Coast (JFK, BOS, FL) than the West, to be sure, but if you’re flying to and/or from locations that more than an hour or two’s drive from salt water, JetBlue is rarely relevant or worthy of consideration. Sure, they have a few flights to places in the center of the country, but not many. Very true but remember that not all airlines can be all things to all people successfully. Totally agreed, and I don’t hold it against B6. If anything, I am surprised that they haven’t yet spent more effort looking toward the center of the country to fuel some growth, especially in small/medium sized college and tech markets where their image as one of the more “hip” airlines might get some traction. In fairness they have decided to open up a route to MSP daily to Boston. If they are willing to expand into what has traditionally been a huge Delta hub, I think it augers that they will be looking to expand in other Midwest areas. Any chance of Hawaiian having a red eye on the return flight from Honolulu? Thta’s the only way for us to be able to fly from Long Beach on their flights every month as we have been doing for 16 years now on United from LAX. No, it’s an afternoon return. As a former planning guy for Aloha Airlines I can tell you that SNA-HNL worked very well both from a standpoint of loads and yields. Hawaiian’s 321s don’t have the required performance to fly from SNA, so LGB sounds like a logical alternative. But my sense is that it will be difficult to get Orange County customers to go to LGB…. they just don’t think about it as a place to catch flights to Hawaii. We had that problem at BUR. I don’t think I would have picked LGB as my first new city, but it will be interesting to watch and I wish them luck. Jin – Thanks for chiming in. Now the question is whether anyone decides to move into SNA to head this off at the pass. United/Continental was in there, but that was half-hearted at best. The evening westbound, redeye return just doesn’t work as well for West Coast-Hawai’i. It wasn’t even daily if I remember right. But then again, I’m not sure which airplanes can even make it anymore. Everyone has densified their aircraft, so I imagine there would be even more load seats on most airplanes Maybe Southwest wants to try it with a 737 8 MAX eventually? But of course, doing that requires pulling down another flight until the passenger cap goes up. Hi CF- The problem with SNA and quite a few of the secondary cities is runway length and aircraft performance. Our 700s could barely do SNA with a thrust bump but an 800 can’t without quite a few load seats. That, in turn, makes the seat mile costs too high to be economic. I am retired these days so am not up to speed with performance of the 800MAX or the 321LR, but I rather doubt either one can economically do SNA-Hawaii. If I were advising HA I would have a look at SBA where there is a lot of money, a lot of travel to Hawaii and no good service. Sounds like the recipe for a 757! Nope, when you put on an economic passenger load plus enough fuel to reach Hawaii a 757 is too heavy for the runway length. Jin – I wasn’t sure if the MAX had better runway performance than the -800. If the MAX 8 can’t do it, then Southwest is definitely out. I’d expect everyone else would be too. The MAX 8 has basically the same thrust as the 800, but with better fuel economy they need a lower fuel load. Whether that would be enough to make the MAX 8 viable were the 800 isn’t, I don’t know. This is puzzling — what facet of A321 performance works at LGB but wouldn’t work at SNA? Are the SNA runways too short? LGB 12/30 is 10,000 ft. I seem to recall AS saying their -800’s would require blocking 20 seats to serve Hawai’i out of SNA. There goes any profit. Yes, that is the main issue. Plus there is a required climb profile for noise abatement that means you have to get high quickly and cut thrust before you get to the noise monitors. First time fliers out of SNA often find the trust cutback after a steep climb to be a little alarming. On a 757 with a pretty empty load, it’s actually one of the more exhilarating departures you can have. LOL! I agree. But for nervous fliers having the nose pitch down accompanied by a sudden decrease in engine noise it can be unnerving! Bill – As others noted, the Orange County runway is very short. With an economic passenger load and the required Hawaii fuel on board the 321 is too heavy for the runway length. The same is true even for a 757. That’s not to say you can’t fly a 321 out of SNA, but not with enough fuel to get to Hawaii. Do you know the minimum runway length for a fully loaded 757 with enough fuel to get from SNA-HNL (assuming the 757-200 with the highest thrust engines)? Just curious, and you seem to have a handle on it. I too love the fun takeoffs at SNA! Regardless, the 757 is awesome, and I try to fly on them as much as I can, especially when it’s a choice between them and a 737! Presuming we are talking specifically SNA and not just any runway of the same length, I think noise would be a factor too. SNA is very particular about that and the older tech engines on a 757 operating at full bore might very well not pass the test. Again, I have never run those numbers for a 757 but I know that on warm days with a full load even our 700 occasionally got tagged. If it only happens every once in a while they just send you a nasty letter, but after you hit a certain number (I forget what, but it isn’t THAT many) they start fining you and the fines escalate quickly. CO, AA and DL all had ETOPS 757s and slots at SNA but never tried that service so good chance that they did run some numbers and it didn’t work for one reason or another. HA does pretty extensive advertising in the Bay Area to make sure people know they fly from all three airports. I assume they’ll likely have a big push in southern LA and Orange County to advertise the new service. If OAK and SJC can support 4-8 Hawaii flights a day, LGB, with no competition from SNA, must be able to fill one A321. I love flying SLC – LGB and more competition has really driven prices down for me, I can routinely find ~$100 RT on someone, half or less than it was just a few years ago. And the airport is freaking awesome anyway! It’s a win-win for B6. This means they get to cut one money losing frequency to NorCal and WN doesn’t get that slot. and a very clever graphic too. No one believed me when I said WN was applying for then available LGB slots. Everyone laughed at me when I said WN would fly to Hawaii with the MAX. With HA coming to LGB, still think WN Hawaii service from LGB is out of the question. I truly think HA wanted to beat WN to the market. But was HA-to-LGB on anybody’s list of predictions for 2018?? Probably not. I remember flying the March 1954 American Air Lines/Continental Air Lines DC-6 thru-planeservice from East Coast via Cincinnati to L.A.ASIDE: While refueling in CVG, someone dropped the hand-fuel nozzle and punctured a right wing skin. After an hour, CAL patched it with ‘tape’….which my sainted-white-knuckled-mother faithfully prayed over all the way to L.A….lol IDEA: How about Jet Blue/HAL A321 thru plane service East Coast via Long Beach to Hawaii? Maybe paint one side Jet Blue, other side HAL colors…Really mess-up Cranky’s Dorks! This must be cranky’s dream come true, nonstop from his beloved LGB to his beloved Aloha state! Even though there is an IAD to HNL non stop, I’m still a bit jealous! It’s not DCA after all! Can’t wait for his first trip report on this new service! I believe JetBlue has 41 slots at LGB. How many do they use? So now JetBlue will have 34? Jonathan – Yes, that’s correct. JetBlue will go down to 34, and Hawaiian, of course, will come up to 1. 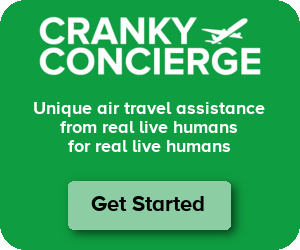 Cranky- I have a question. I was trying to book one of these flights and checking out the prices, and when I went to book it, it only showed main cabin and first, no extra comfort. Then I noticed they blocked out all the extra comfort for all the Long Beach flights in the entire schedule. It was available just a few days ago. When I asked them they said they did still have it available but weren’t currently offering it. I’m just curious if there is some reasoning behind holding back the extra comfort seats? Seems odd to me. I would think they would want to try to sell the premium economy cabin as much as they could. Rudy – If there is a rationale behind it, I don’t know what that would be. Seems strange that they wouldn’t sell that. Just How Did American Perform After Its Pilot Schedule Problem?